Eaglehawk is a residential suburb in the north-west of urban Bendigo. Its town centre is 5 km from the centre of Bendigo. Gold was discovered at Bendigo in October 1851 and the gold-bearing land extended several kilometres north and north-west of Bendigo, beyond Eaglehawk. California Gully and Sailors Gully recorded gold finds in the first half of 1852, along with Eaglehawk. In 1854 town lots were surveyed and sold along High Street, Eaglehawk, where it divides into Sailors Gully and Pegleg Gully Roads (ie Pyramid Hill Road and Loddon Valley Highway). A National school was opened in 1854 on the site occupied by the present primary school. Two Methodist churches were opened the following year, and further north at Sailors Gully a second school was opened (now Eaglehawk North school). The 1860s were a period of rapid growth, but with mostly short-lived or hastily run up buildings. The next two decades saw more substantial developments. 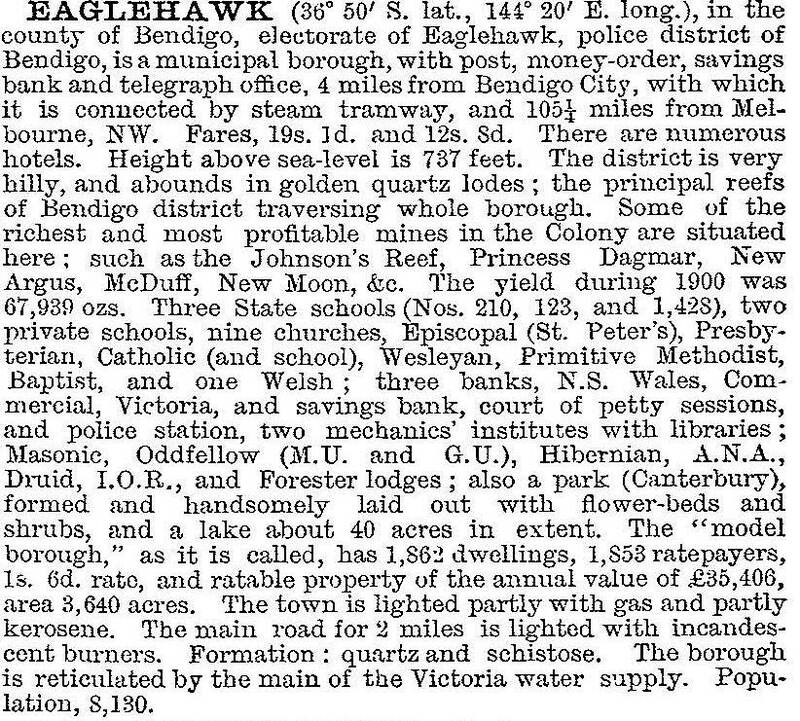 Eaglehawk borough was created on 29 July 1862. By the end of the decade there were also Anglican and Presbyterian churches and a mechanics' institute. 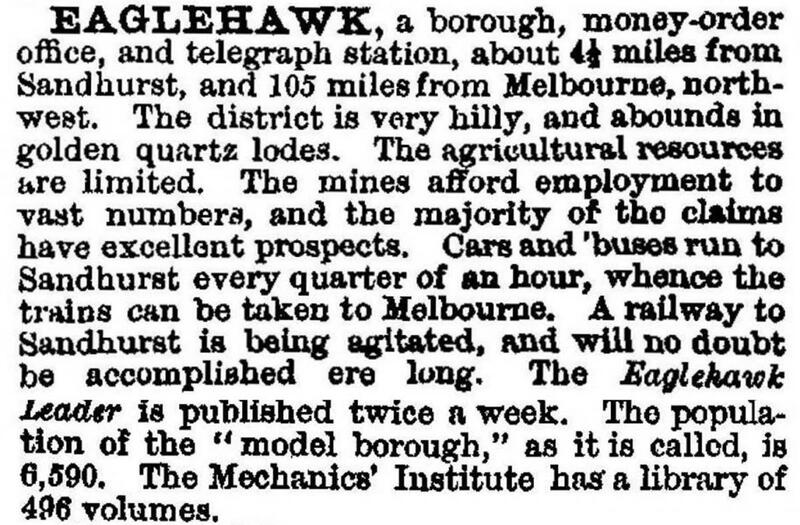 Gas was laid on in 1866, the railway from Bendigo to Bridgewater was opened in 1876, with a station at Eaglehawk. At about that time mining employment and the borough's population began to decline, more than halving between the 1901 and 1933 censuses. Minor population growth occurred in the 1960s, a high school was opened in 1964 and the tramline closed in 1973. The civic and religious infrastructure became noticed as a well preserved heritage site, particularly the area extending from the primary school to the Uniting (Methodist) church. The town hall has a striking setting. Away to the west is a small group of stone cottages (1875) in Clarke Street, forming a hamlet around a mining gully. Known as Harvey Town, two of the cottages are on the Register of the National Estate. Eaglehawk has a secondary college (559 pupils, 2014), a Catholic (1904) and two State primary schools (Eaglehawk 113 pupils, 2014, and Eaglehawk North, 332 pupils, 2014), two golf courses, Canterbury Park with swimming, tennis, bowls and croquet facilities, an oval, the Albert Roy Reserve, several churches, three hotels, public halls and a recreation/leisure centre. A museum is in the former court house which is near the mechanics' institute and the former town hall. An annual arts and dahlia festival is held in March-April. 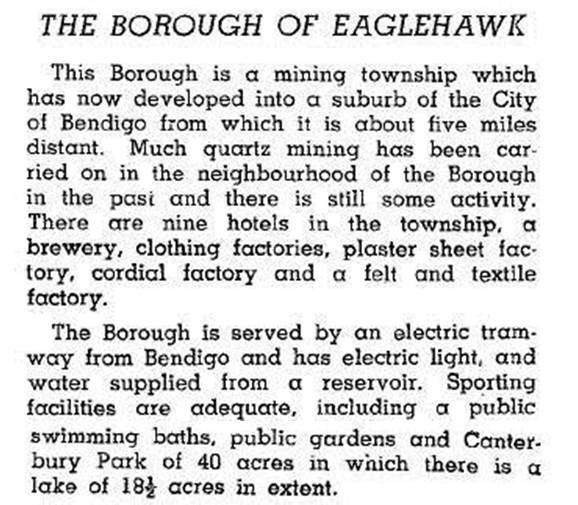 A disused mine site was identifed under the Eaglehawk Structure Plan as a potential industrial estate. Eaglehawk borough was united with Bendigo and Marong Rural cities and Huntly and Strathfieldsaye shires on 7 April 1994 to form Greater Bendigo city.